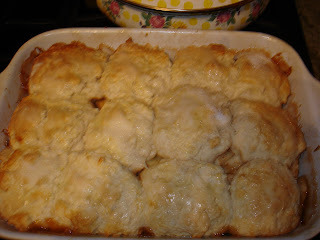 I have made many an apple pie, but until tonight I had never made an apple cobbler. Although apple season really came to a close at the conclusion of autumn, apples and pears are pretty much the best fresh fruits to get in the northeast this time of year. 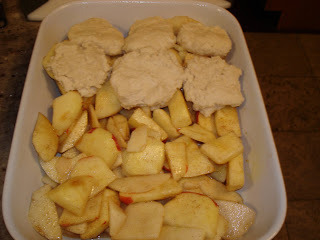 The best cobblers I have made are peach cobblers, but a recipe for those on this website will have to wait until June. 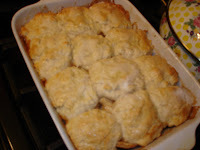 Tonight, I decided to vary from a traditional apple pie recipe and instead prepare an apple cobbler, which is kind of like an upside down apple pie wtih a bit of a scone like cobbler crust. Cobblers make me think of the Wizard of Oz. As silly as it sounds, when I am making the cobbles for the top of a cobbler, I can't help but think of Dorothy and the Munchkins singing as they skip down the cobbled Yellow Brick Road. Mix the dry ingredients, then cut in the butter, using a stand mixer. Add the milk until a dough is formed. You can add a little bit of extra flour if you need it. Put the filling in the lasagna pan and form cobbles out of the dough to cover the filling. Gaze with an eggwash and put a couple tablespoons of sugar on top of the egg-glazed cobbles. Then bake for about 1 hour at 375 until lightly browned. I should mention now that I love baking, probably more than cooking - unless the cooking involves making food from scratch. I think this is the inner-molecular biologist in me. Cooking is fun, but there is really a science to baking that I enjoy. I am hoping to do some cheese-making in the future as well, which I am sure will amuse the inner scientist in me. So how'd it turn out? It turned out really nicely - the top was the same texture as a scone, and the bottom was sweet and delicious, like apple pie filling!